KOCHI, India – Baiju Dharmajan is one of India’s most celebrated guitarists. 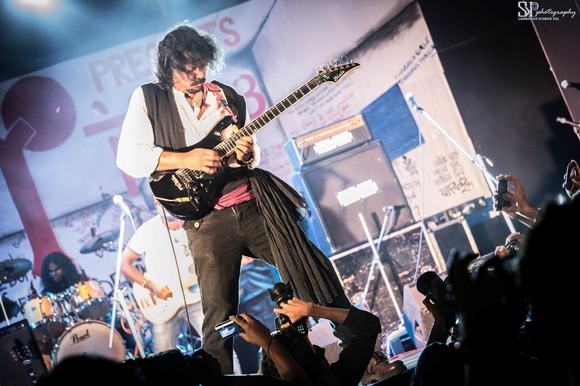 Known as “God of the Small Strings” to his fans, Dharmajan has been voted India’s best guitarist [at the Jack Daniels Rock Awards for two years in a row in 2008 and 2009] and was a long-time member of legendary Indian rock band Motherjane before launching his solo career and releasing his first solo album The Crossover in 2012 on the Cochym record label. Strongly influenced by Carnatic music, Indian artists K.J. Yesudas, Ilaiyaraaja, Raveendram and G. Devarajan and guitar heroes like Jimi Hendrix, Jimmy Page and Jeff Beck, Dharmajan is known for his extended, Carnatic-inspired guitar solos – and his long-time use of HARMAN’s DigiTech pedals. “For the last 30 years I’ve been playing, DigiTech pedals have always been my first choice, to the point where it’s hard for me to think about using any other brand,” said Dharmajan. His current pedalboard includes the DigiTech Main Squeeze compressor, Hardwire Tube Overdrive, Harmony Man intelligent pitch shifter, Whammy™ pitch shift pedal and a JamMan™ Looper. For Dharmajan, DigiTech effects aren’t add-ons – they’re fundamental to his sound, whether on the iconic Motherjane album Maktub, voted 2009 Album of the Year by Rolling Stone India or his versions of the Indian national anthem “Jana Gana Mana” and the popular song “Mile Sur Mera Tamara” promoting national integration and unity in diversity. “One of the questions I get asked most often is how I am able to produce a certain sound or tone. I always tell young guitarists that it has a whole lot to do with the combinations of pedals that you use,” added Dharmajan. “My DigiTech pedals have played a pivotal role in the tones you hear in my solo album The Crossover and in many Motherjane songs. I should also point out that from a practical standpoint the pedals have helped me greatly at live concerts because they are able to drive a whole gamut of amps very effectively,” Dharmajan noted. As an artist who has helped define the sound of Indian rock guitar, Dharmajan continues to innovate, blending Indian and Western musical influences in his band Baiju Dharmajan Syndicate, in the group Kashmir co-founded with Santee Thomas, in experimental jazz-fusion band Karnatriix and in collaborations with artists like Susmit Sen of Indian Ocean and electronica act Midival Punditz.